Dappros team deals with security tokens (ST) and security token offerings (STO) as part of our work in providing blockchain technology solutions for our customers. Blockchain powered securities is a hot space right now and it is undergoing rapid development. There is no consensus on single ERC standard within blockchain developers community and there is no final say from regulators. Most countries simply do not have any provision in their companies and securities legislation in regards to security tokens. However security token offerings are taking place and could well be done today without having to wait years for regulators to catch up, provided issuers use existing legal base correctly and take care of the needful such as KYC/AML, SPV governance etc. Technology is running ahead as usual and there are a number of STO platforms that allow businesses to issue security tokens without having to reinvent the wheel. 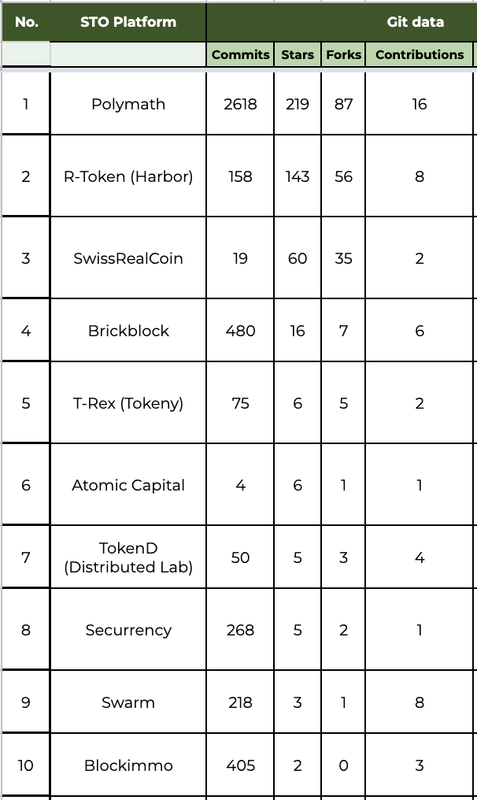 We have looked at some of them in our previous publication on this topic: Comparison of Security Token Platforms (developers perspective). We continue to analyse security token engines and platforms so that we can keep making informed and professional choices on best matching technology to be integrated into the projects of our customers and our own low-level DLT platform offering. 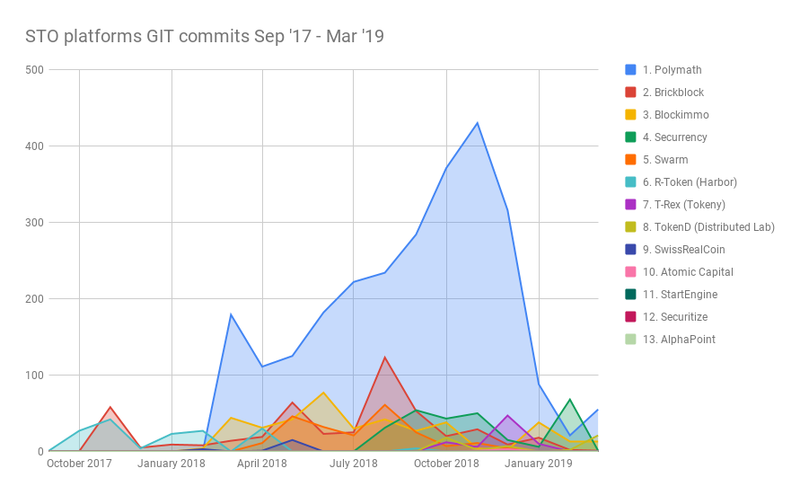 Today we’re sharing some insights we’ve obtained based on publicly available Github and Gitlab data of prominent security token platforms. As most STO platforms have an open-source component (a norm for blockchain projects), this allows us to track their updates via code repository hosting platforms such as Github and Gitlab. We have looked into 13 platforms known to us. Most of them are universal STO platforms but we have also included real estate specific platforms as we have dealt with multiple projects in this sector and it seems to be one of the verticals that drive the global security tokens and tokenized securities adoption. Warning: this is not an ultimate metric of projects’ success. Github commits and “stars” don’t always reflect the quality or pace of development. There may be issues with our source data. We’re only providing results of our own research which may have failed to locate all code repositories relevant to each project. Our research has been limited to public repositories only. STO platform projects have different approaches to open-source and some of these platforms would only put a small portion of their codebase into public repositories, while some others might keep all code closed source. All these factors could have impacted our results. We’ll be grateful for comments and links to additional data sources so we can refine this analytics. 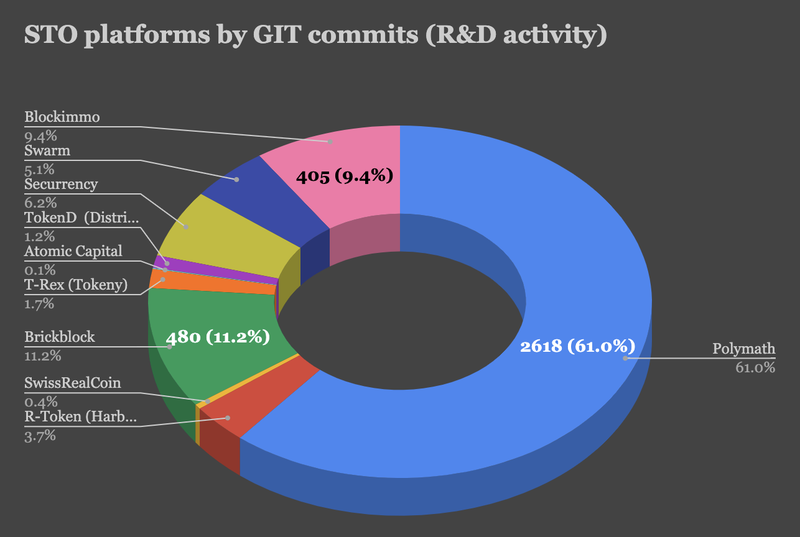 Figure 1: STO platforms by overall GIT commits. 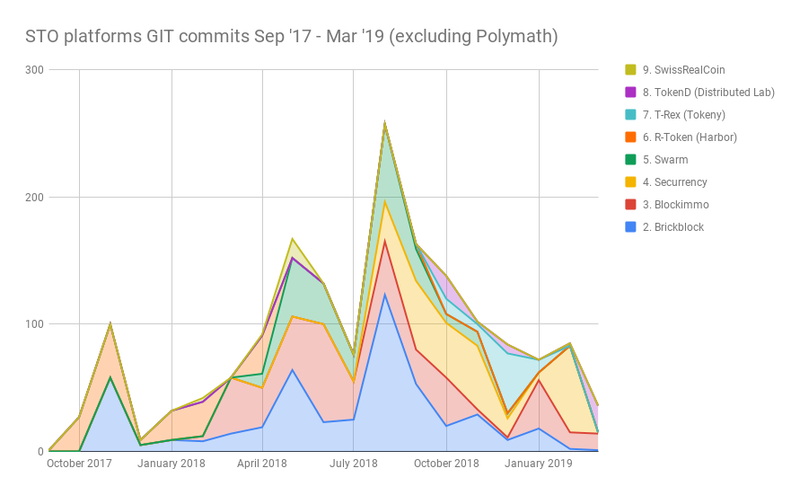 As we can see US-based Polymath platform is far ahead by number of GIT code commits. 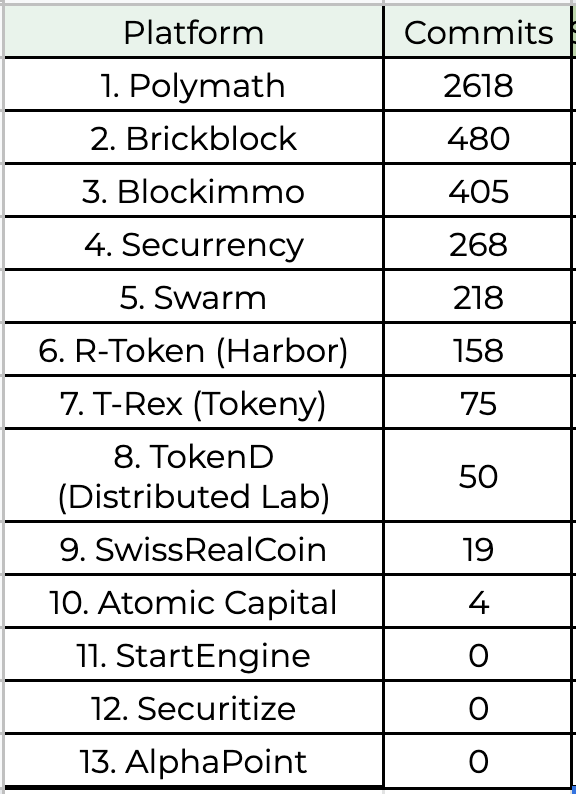 It is interesting that other universal security token platforms (places 4-8) have been overtaken by vertical-specific Brickblock and Blockimmo (places #2 and #3), STO platforms focusing on real estate. In Github, Gitlab and other code repository management systems the code commits simply indicate the number of various updates to the codebase of the project. This can include any change to documentation file or a line of code added by project’s R&D team. On its own this information isn’t sufficient to make judgments regarding overall activity of the project. This is why we also look into how many developers have starred or forked the repositories. 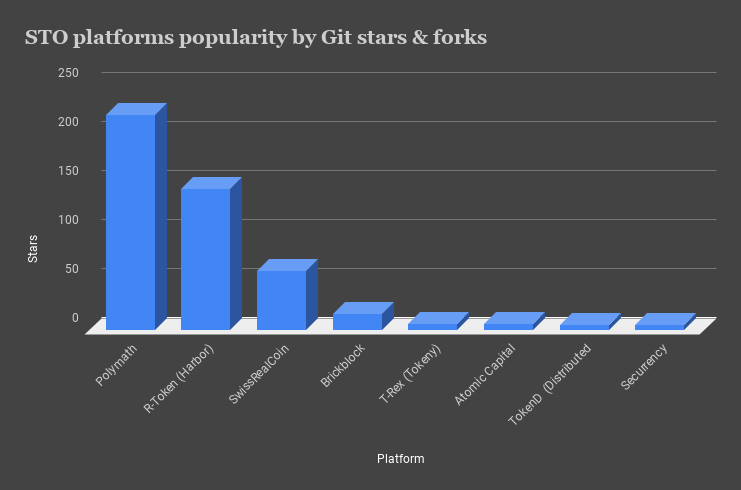 If you aren’t familiar with popular code repository platforms, “star” means someone has added the repository into their favourites, and “fork” means someone has created a local copy of the whole repository in their account. The latter happens, for example, when a 3rd party developer needs to create a modification of an original open-source project. 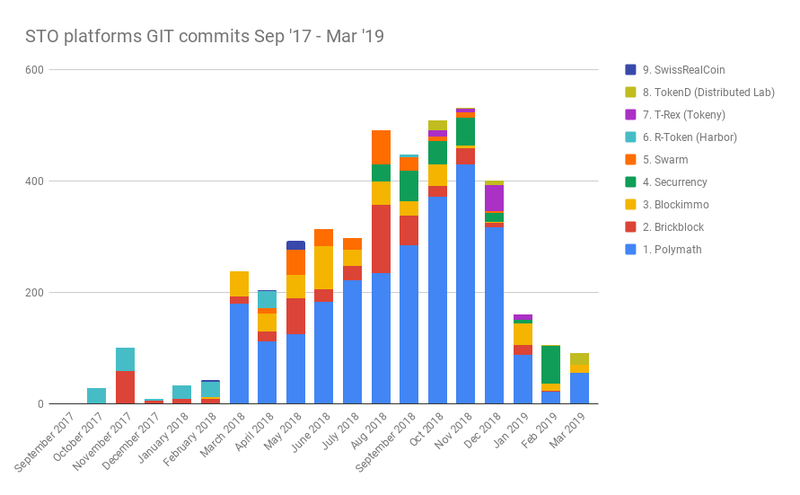 Here we are taking the STO platforms code commits data over last 19 months (September 2017 – March 2019) to look into dynamics over time. Here we provide an updated and extended feature comparison matrix of universal security token platforms. First version of this matrix has been published in our previous analysis of STO platforms where you may find some additional details we are not covering here. Feature sets are according to Dappros team research at the date of publication. It isn’t always possible to correctly establish specifics such as whether indeed whole platform is open-source or just a part of it, whether KYC (“know your customer”) and AML (anti money laundering) are supported natively by platform or via 3rd party integrations etc. We’ll continue the research and will be publishing more detailed insights into these aspects. Market leader. It is safe to say given current data Polymath is the leader platform judging by R&D activity and popularity data. We would not however automatically recommend to use Polymath in all projects. Another platform or a self built solution might be a preferred option depending on project requirements, geography, private vs public blockchain strategy etc. (1) Polymath and Harbor are the most prominent US based projects, however Polymath is more focused on equities, while Harbor seems better suited for real estate projects. I personally like what Polymath is doing in pushing forward the development of security token standards. ERC-1400, ERC-1411 and ERC-777 seem promising but without consensus and a ready ecosystem platform and developers often choose to stick to plain ERC-20. It will be great to see some support around a single standard from Ethereum Foundation. You can read more about this in Polymath Medium post on evolution of a security token standard. (2) Tokeny is the leading European security tokens project possessing experience of real issuances across EU and UK including regulatory aspects and necessary integrations provided by partners ecosystems. The platform however raises questions around potential vendor lock-in and control as they don’t seem to offer any self-hosted options. Tokeny is targeting public Ethereum blockchain and seem to be best fitted to support your Europe-focused security tokens issuance. (3) TokenD unlike Tokeny offers their codebase and documentation open-source supporting the self-hosted and on-premise model. There is no cloud option so far and the bigger problem in my opinion is that the platform isn’t based on Ethereum. We can only recommend this in select cases where customers don’t plan to list tokens on public blockchain and where disconnect from Ethereum ecosystem is not a disadvantage. To summarise, the whole space around STO and securitised assets undergoes rapid development technology wise, overshadowed by slower progress around common standards, interconnected ecosystem agents, regulations and legal frameworks. It is possible to carry out successful STOs today but tools, frameworks and approaches need to be chosen wisely taking into account both changing landscape and proven solutions. We have provided some insights into how STO platforms are developing which we hope you find useful. Stay tuned for further updates on this important topic.